Our goal is to keep our customers assured that their household items will be kept in a secure facility with the finest conditions. If you are looking for a reliable space to secure your household items, you have come to the right place. Our facility is located at 400 Springbank Ave. South, Woodstock, ON. Our facility is climate controlled and protected by a monitored security alarm system.Each item is inventoried and tagged with a Personal Lot Number and Item Number to provide easy retrieval. 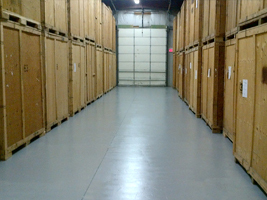 We have knowledgeable staff providing personal service for your needs.Our warehouse is designed to handle commercial and residential storage needs on either a short or long term basis at reasonable prices.